I mentioned Lewis Koch's Garageography 3.0.7 the other day. While hunting around for more information about his work I came across an earlier project of his which I really quite liked. 1mag3 had a link to Notes from the Stone-Paved Path:Meditations on North India. "The significance of Koch's superbly printed images lie in precisely not reproducing the tourist mentality toward that over-exoticized land, India, as found in much color photography by both Indian and Outsider alike. Dayanita Singh, a prominent Indian photographer, has bemoaned the fact that some ofher own work caters to Western eyes. And reviewers have pointed out that Robert Arnett's recent book India Unveiled still treats us (in his text) with the Eurocentric myth of the Aryan invasion of India in 2500 B.C. and (in his photographs) with hot, vivid color we Westerners usually associate with India. But Koch's self-conscious personal documentary aesthetic eschews color; shot in black and white, they ignore the stereotypical exotic National Geographic subjects. Instead, this photographer, working within the "snapshot aesthetic" of street photography (whose purity he "ruins" with his textual asides), frames the seemingly banal, the lucky finds, the neglected, and the accidental occurrence. It is almost as if we are seeing India through an Indian flaneur's eyes. This is hard to do given the daunting accretion of texts and documents, fantasies, legends, jokes by indigenous and foreign peoples concerning that vast land. Koch reminds us of this by pairing some of those diverse textual fragments with his images." Now the above is a pretty ambitious claim. While channel surfing the other day I happened on the TV programme Travels to The Edge with Art Wolfe where he was in Allahabad and Varanasi photographing all the pilgrims converging on the Ganga and it was rather repugnant - vapid, condescending, superior. For me, Koch's work appears to be the polar opposite. 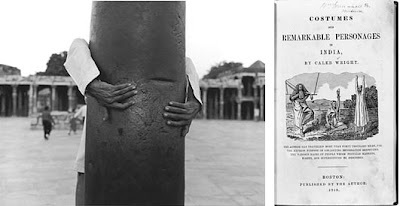 Either way I certainly get a feeling (and I've only seen it online) that we certainly see India through flaneur Lewis Koch's eyes - it's as much about Koch as it is about the place and the people - and in that way seems honest.